A Nine Judge Constitution Bench of Supreme Court of India Today, in a batch of petitions including Jindal Stainless Ltd. Vs State of Haryana upheld the constitutional validity of Entry Tax imposed by States on goods coming in from other states. The Bench has also directed the three Judge Bench to decide whether the States’ entry tax laws on the basis of Guidelines issued by this Bench. 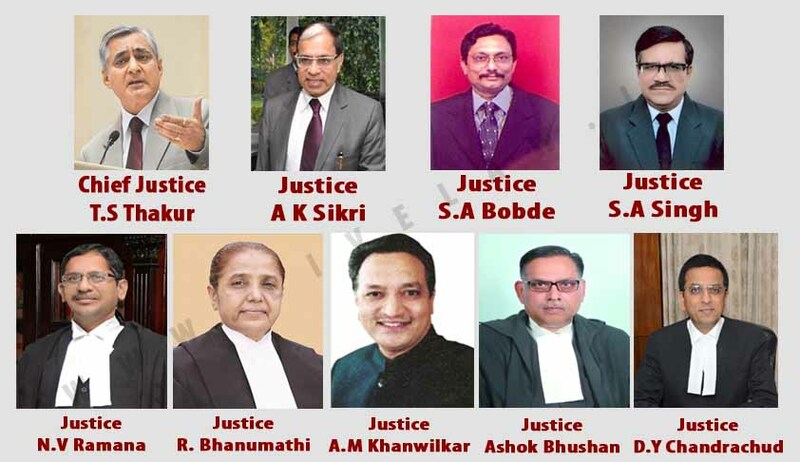 Chief Justice pronounced separate judgment comprising Mr. Justice A.K.Sikri and Mr. Justice A.M.Khanwilkar while Mr. Justice S.A.Bobde, Mr. Justice Shiva Kirti Singh, Mr. Justice N.V.Ramana, Mrs. Justice R.Banumathi pronounced separate Judgments for the Bench. Dr. Justice D.Y.Chandrachud and Mr. Justice Ashok Bhushan pronounced separate dissenting judgments. Taxes simpliciter are not within the contemplation of Part XIII of the Constitution of India. The word ‘Free’ used in Article 301 does not mean “free from taxation”. Only such taxes as are discriminatory in nature are prohibited by Article 304(a). It follows that levy of a non-discriminatory tax would not constitute an infraction of Article 301. Clauses (a) and (b) of Article 304 have to be read disjunctively. A levy that violates 304(a) cannot be saved even if the procedure under Article 304(b) or the proviso there under is satisfied. The compensatory tax theory evolved in Automobile Transport case and subsequently modified in Jindal’s case has no juristic basis and is therefore rejected. Decisions of this Court in Atiabari, Automobile Transport and Jindal cases (supra) and all other judgments that follow these pronouncements are to the extent of such reliance over ruled. A tax on entry of goods into a local area for use, sale or consumption therein is permissible although similar goods are not produced within the taxing state. Article 304 (a) frowns upon discrimination (of a hostile nature in the protectionist sense) and not on mere differentiation. Therefore, incentives, set-offs etc. granted to a specified class of dealers for a limited period of time in a non-hostile fashion with a view to developing economically backward areas would not violate Article 304(a). The question whether the levies in the present case indeed satisfy this test is left to be determined by the regular benches hearing the matters. States are well within their right to design their fiscal legislations to ensure that the tax burden on goods imported from other States and goods produced within the State fall equally. Such measures if taken would not contravene Article 304(a) of the Constitution. The question whether the levies in the present case indeed satisfy this test is left to be determined by the regular benches hearing the matters. The questions whether the entire State can be notified as a local area and whether entry tax can be levied on goods entering the landmass of India from another country are left open to be determined in appropriate proceedings.